The Gladys Morrell table, a key symbol in the fight to get the vote for women in Bermuda, will go on public display on Monday after the Bermuda Historical Society successfully bid for the item at the Bermuda National Trust Auction on Saturday. As an act of defiance against being denied their voting rights, the Bermuda Suffragettes refused to pay Parish Taxes which resulted in the seizure and subsequent auctioning of furniture belonging to the group. Remaining steadfast to their cause and refusing to back down, a band of suffragettes and their supporters attended these annual auctions where they bid on, won and returned seized items to their owners. In Gladys Morrell’s case, it was the same table every year until property owning women were granted the right to vote in 1944. That vote was a vital stage in the march to universal adult suffrage which was achieved 19 years later. 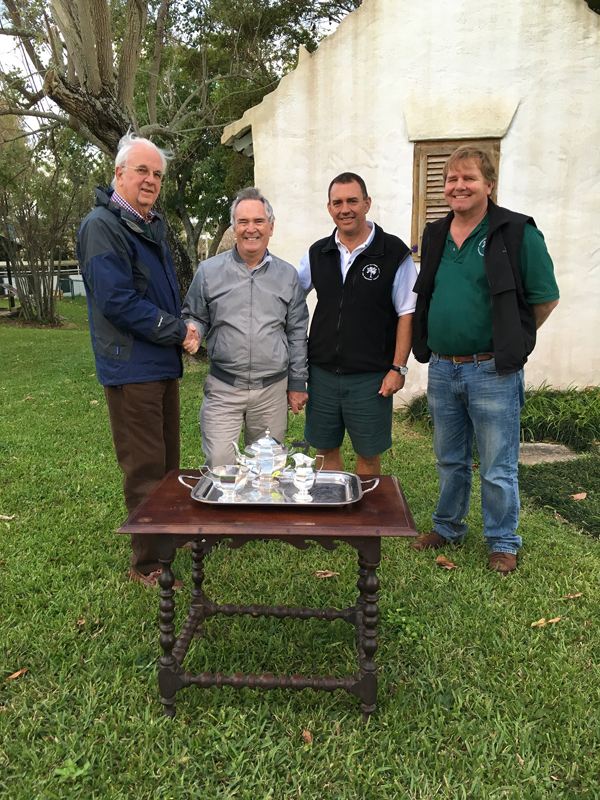 Bermuda National Trust Auction chairman Hugh Davidson, Bermuda Historical Society President Andrew Bermingham, BNT President William White and BNT Executive Director Bill Zuill with the Gladys Morrell table and tea set at Saturday’s auction in the Botanical Gardens. On Saturday at the Botanical Gardens, the Bermuda Historical Society was successful in bidding for the table and Society President Andrew Bermingham said it will go on display at the Society’s museum in Par-la-Ville Park on Queen Street tomorrow. He added: “This iconic piece will remain on public view for posterity as a reminder of the role Gladys Morrell plated in ensuring the right of women to vote. “She is one of Bermuda’s national heroes and we hope people will come and see this this piece of more modern history. The table was very old and valuable in its own right but it also has huge historic value. 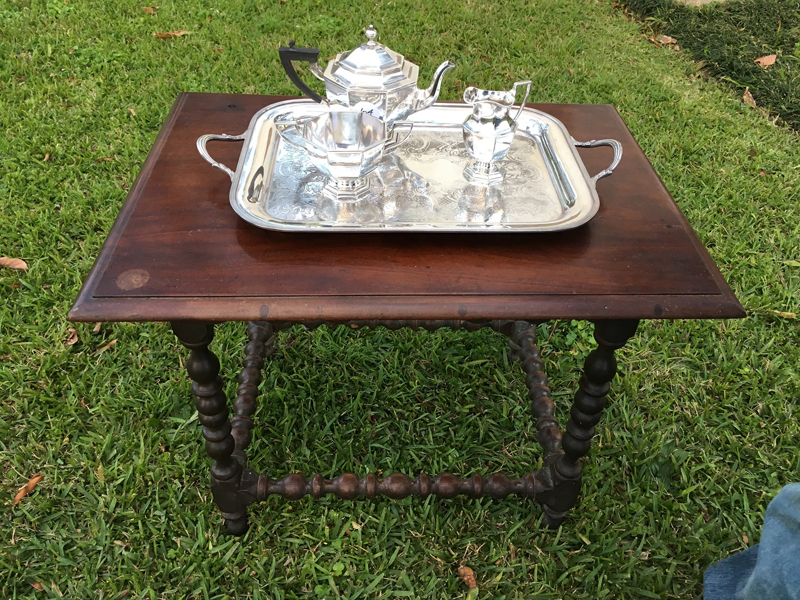 The Gladys Morrell table and tea set, which will go on display at the Bermuda Historical Society Museum. Trust Executive Director Bill Zuill said, “We are very pleased that our friends at the Bermuda Historical Society were successful in bidding for the table, and for a tea set that belonged to Mrs Morrell and are thrilled that the table will now be used in telling story of women’s suffrage in Bermuda. The table being auctioned on Saturday. 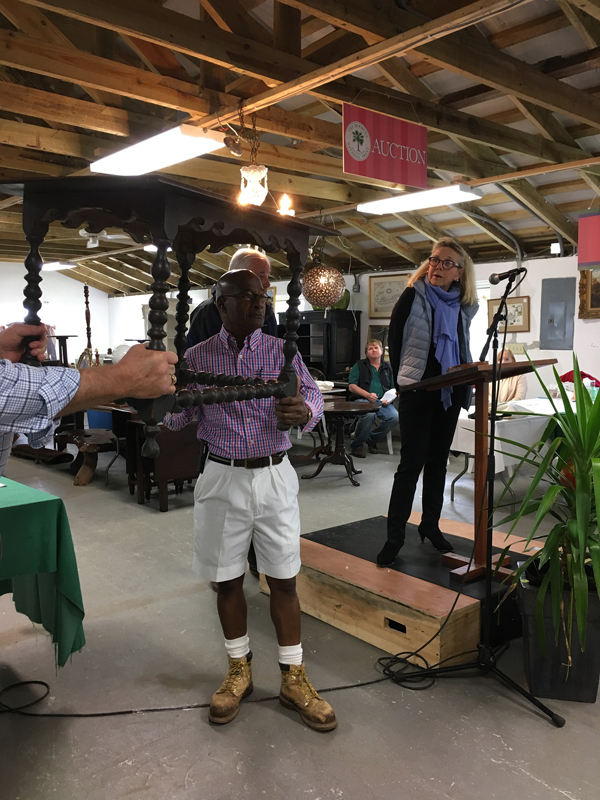 Lionel Thompson is holding the table, while auctioneer Judiann Smith seeks bids. “The Trust is very fortunate to have a dedicated team of more than 50 volunteers who come together every year to make this event an extraordinary success, which not only raises money for the Trust but brings people together from all walks of life,” Mr Zuill said.